Posted on October 20, 2018 by Thermoptic Tagged GoldenEyeguiden64nintendoretrogaming	CommentsNo Comments on GoldenEye Invert aim finally fixed! GoldenEye Invert aim finally fixed! Multiplayer deathmatch in GoldenEye 007 for the N64 was just amazing! Screencheating, Slappers only, Golden Gun, Oddjob, Proximity mines, so much fun so fond memories! Oh and if you are a big fan of the game and have not yet watched the amazing parody clip made by College Humor called GoldenEye Stand-Off then go watch it right now! When playing GoldenEye in Solo mode you can switch Inverted Aim on and off when you are playing the game, just bring up the options menu that are located in Bonds very elegant wrist watch and change this. But in multiplayer this option does not exist! All four players have the same settings that you set when playing Solo mode. So if you have Invert ON in Solo mode, then all four players in multiplayer has Invert ON also. This problem has bothered me for many years and I have constantly been looking for a solution for this problem. If you are using an Emulator you can fix this by just changing the look up and down in the key configuration for each player. But this is not possible on a real N64. There are some amazing N64 flash cartridges out there, so i figured that all we needed to have a fix for this problem was to have some amazing hacker to fix a romhack for this. So i got in contact with SubDrag who is the owner of the former fan site GoldenEye Vault. And guess what, he is also a programmer and romhacker 🙂 After talking to SubDrag he managed to fix this Invert fix rom in just an hour and released the hacks on the wiki N64 Vault for everyone to download! So now finally we can all play GoldenEye 007 on a real N64 (if you have a flashcart) where every player can have their prefered aiming style! SubDrag solved this problem by creating three different hacks, each hack inverts the control on different player counts. 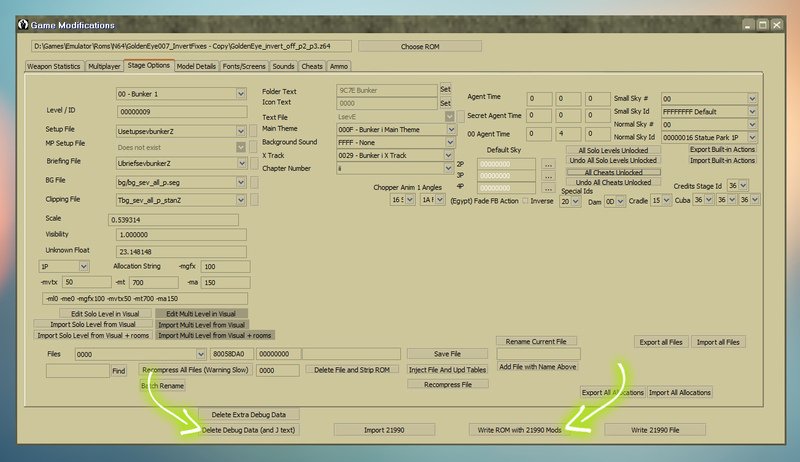 So for example if just two players want to have Invert aim off then you need to use the “Goldeneye (U) [!] NoInvert2P3P.xdelta” hack for this. So the best solution is to have four different roms on your flashcart and just pick the right one when you are going to play. Super simple! I have only tested these hacks on an N64 Emulator but they should work perfectly with a flashcart on a real n64 too. But there was still one little thing i was missing and that was to have ALL levels, cheats and characters unlocked for our GoldenEye gaming nights. There are ways to fix this by downloading save files or using gameshark codes.. or just do it the very time consuming way and unlocking everything by playing through the game in solo mode! But as i love romhacking there must be a way to just hack each rom to have everything unlocked right from the start. And yes i found a solution for this. 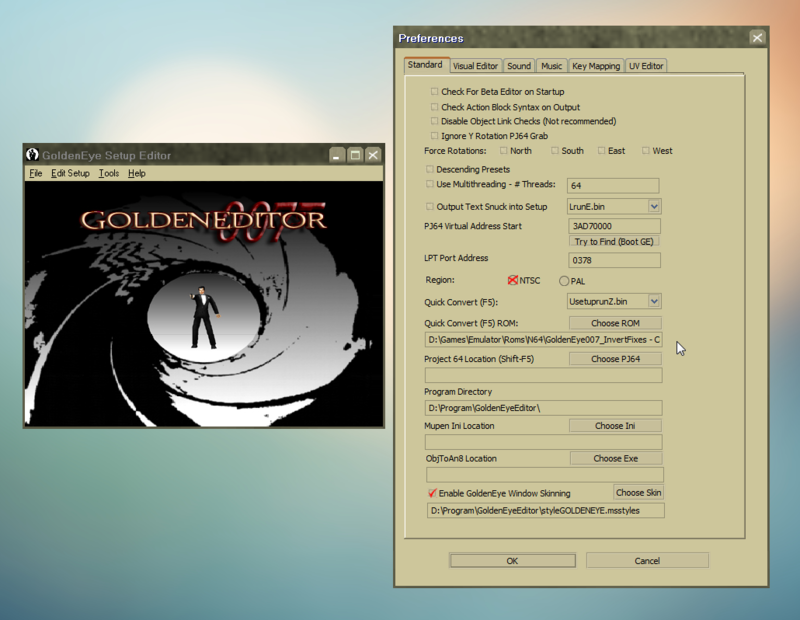 SubDrag who fixed this hack for us has co-developed a romhacking tool for GoldenEye called GoldenEye Setup Editor 3.0. With this tool you can unlock everything and patch the roms. If you want to know how to do this scroll down to the next post or click here! So that’s it, after all these years of inverted aim problems when GoldenEye is finally over! Big thanks to SubDrag for these hacks and all his help. The Invert fixes and other hacks for GoldenEye is available at N64 Vault.